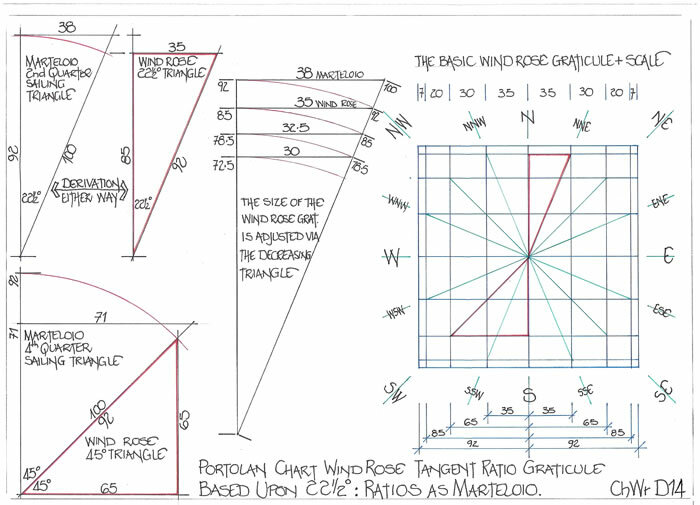 WIND ROSE CONSTRUCTION ON A PORTOLAN; REVISIONS TO THE ORIGINS OF THE CHARTS FORMAT AS DRAWN. The first extant charts are now the Portolan’s of Petrus Vesconte and Angelino Dulceto following the self critical analysis by R J Pujades of evidence to date the Carta Pisana chart. He had formerly agreed, without evidence (his words), that that chart was dated to c1290 with the Cortona Chart as c1300. These are now believed to be much later, by at least 100 years, and thus the listings change as presented within Les Cartes Portolanes and the determination of the configuration of the dates for original charts. This dating configuration is welded to the graticule of the wind rose, to the most important initial moment possible as its drawing methodology can be shown to develop with time. Petrus Vesconte (c1310 to 1330 for his charts) therefore drew the first extant Portolan chart dated 1311 which is now held in Florence, ref CN1, and thereon are included two scale bars. Curiously, but perhaps definitively, Petrus Vesconte chose to draw the scale bars in a cruciform thus denoting that the scale applied to all cardinal directions from a central point, confirmed by the cruciform being set in a circle and oriented NSEW. But upon the chart there is only one set of lines which comply with the cruciform message. They are the graticular lines of the wind rose and as will be proven are the basis of the charts configuration. “most 14th and 15th century charts- but significantly not all- reveal a hidden circle scraped into the vellum with a compass point”. He goes on to state that as an investigation the charts were subjected to analysis by special lights and there was no circle. 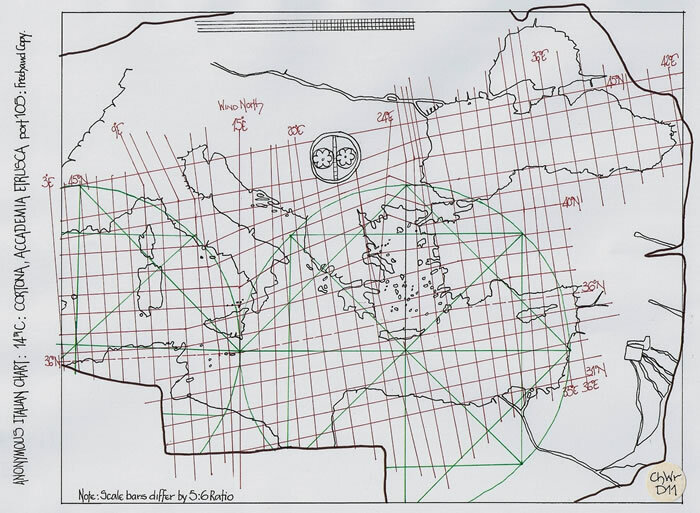 ” the simplest way to position the 16 basic points on which it is based was to draw a clearly visible circumference (those of the Carta Pisana and the Cortona chart are in red ink)—–. Indeed the clearly visible circumference is absent from all works by Vesconte and Dulceto”. At this point in a research paper (or major book) alarm bells should have sounded quite clearly. If it has been conclusively proven that circles are not drawn to construct the wind rose graticule, there had to be a simple alternate method to the circle. As far as I am aware, such alternate method has never been discussed in the literature, aside from my own publications, which can all be found on my website rather than searching journals etc. The wind rose of 16 winds is formed from the 22 ½° segmental lines set out from a central point. Draw a cruciform representing NSEW and quarter each quadrant and the 16 lines are there-by denoted. But, as each is 22 ½° from the next their spacing can be calculated from the triangles which are formed in the square of the whole design. A simple geometric calculation to make for only two winds, the 22 ½° and the 45°winds as the 67 ½° wind is merely the 22 ½° wind from the other line. Thus the NSEW lines can be drawn and when all 16 are set out they form the background graticule of each Portolan Chart. At this point if the medieval mathematics of a triangle requires to be fully understood then I suggest the reader immediately scrolls to the end of the text and reads; “Postscript; A guide for the Perplexed”. The data is all medieval and complements the Tavola de Marteloio, and indicates how medieval mathematicians battled with the necessity to produce ratio numbers which they knew were slightly inaccurate, but could do nothing about it. Mathematically they can be expressed by four simple ratio numbers, 35/30/20/7, which represent the distances from the centre point of the NSEW cruciform in the cardinal directions. When all are drawn the graticule is formed from a series of squares and rectangles (oblongs). The squares are 35 x 35; 30 x 30; 20 x 20 and 7 x 7, with rectangles (oblongs) varying from 35 x 30 to 35 x 7, etc. 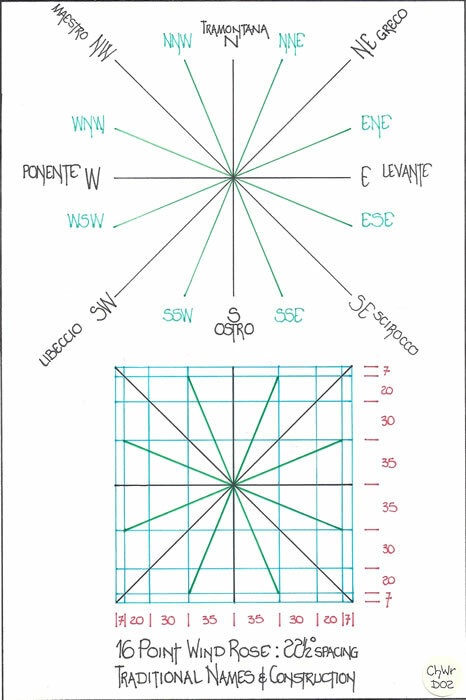 This is the simplest methodology available to form the wind rose graticule and hence the wind rose colour coded red, green and black can be drawn. Having established this simple method it can be applied in analysis of the Petrus Vesconte 1311 chart to ascertain if the measurement thesis is correct or not. The chart held by the State Archive, Florence is illustrated on pages 72/73 of Les Cartes Portolanes and has two cruciform scale bars. 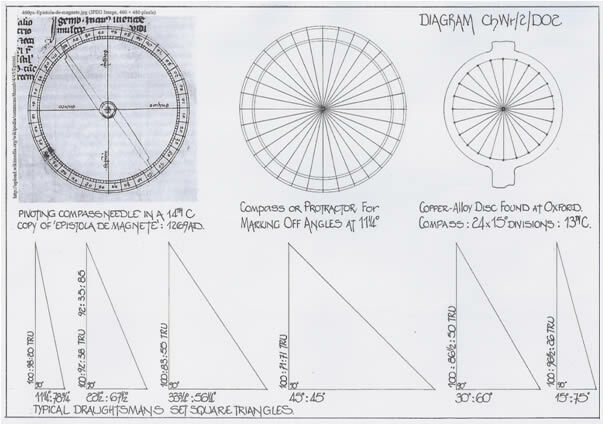 Used to measure the background wind graticule (as diagram ChWrD01 illustrates) it will be seen to be a precise 35/30/20/7 unit graticule and hence the cruciform scale bars are there to set out firstly the wind rose onto which the chart is drawn. But, does the cruciform scale also perform the function of being a scale for the chart itself. The scale of the chart can be assessed vis a vis the cruciform by comparing the chart distances measured by the scale bar to geographical distances, and thus an estimate can be made of the scale bar measure. 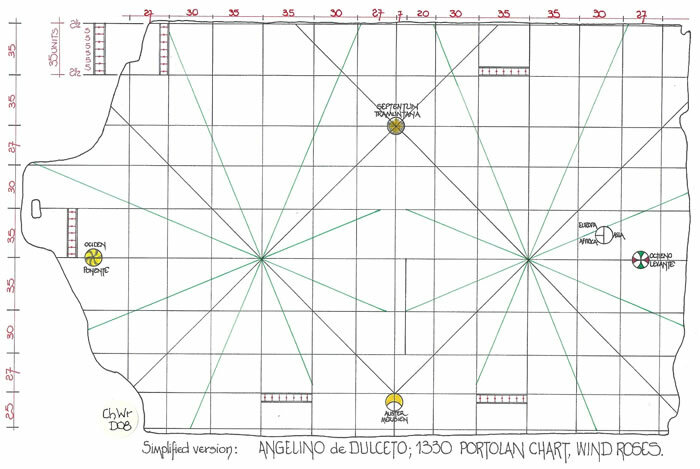 I discuss later the comments by R J Pujades regarding the advisability of trying to obtain a scale for a Portolan Chart, but as I consider the scale is set by the wind rose it is opportune to illustrate that it can be used on a chart. Thus, several distances were measured across the chart using the scale bar and then compared to the actual geographical distance (see appendix for the proof of comparative distances being correct). The outcome was an average of c12.5Km per unit which is c8 Toscane Miglia, or c9 Miliaria Passuum, but more importantly it is 2 leagues of 4 miglia each. The copy is obviously a redraw of the original chart, but a very accurate redraw and is taken from the Encyclopaedia Britannica, 1911, volume 17, maps, p461. This copy of the Portolan (diagram ChWrD03) exhibits the eastern Mediterranean Sea from Sardinia to the Levant. It includes the Gulf of Sirte in the south and the Sea of Azov in the north. The redraw has an added scale bar of 0-50-100 Miglie and is by numbers twice that of the cruciform scales on the actual chart. It is derived from descriptive texts which state the scale bars are based upon 10 miles per division as will be discussed later. Thus we see on the diagram both sets of figures, 14/40/60/70 Miglie and the ratio figures 7/20/30/35 which are as per the cruciform scale. 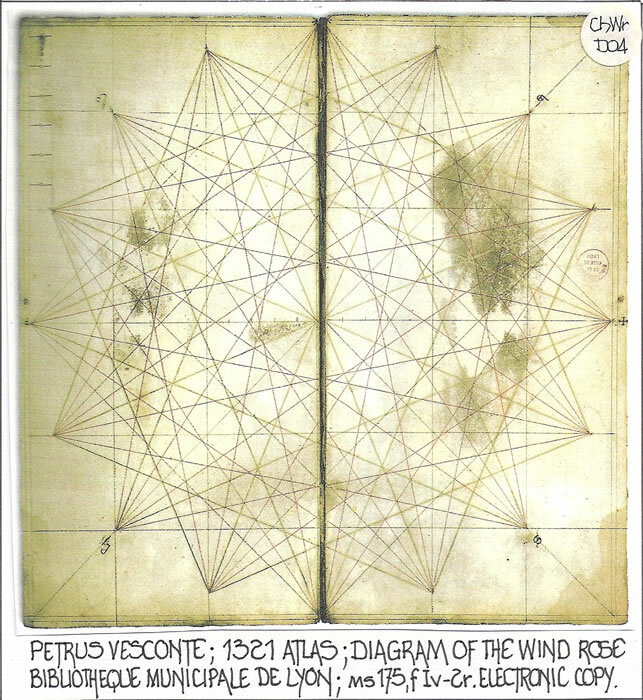 This copy of Petrus Vesconte’s early work does indicate all of the wind rose proportional lines, 35/30/20/7 which form the whole wind rose, and thus I can state quite plainly that the original 1911 draughtsman had already solved the setting out. But most pertinently the scale bar, 0-50-100 Miglie, and the cruciform scales are also the scale bar for both charts, and can now be assessed. Why would the wind rose graticule be determined by the scale bar? Apparently therefore Petrus Vesconte has used the scale bar upon his charts to set out the whole, has considered it the basis of the chart and then drawn the actual map to suit. If there is a graticule which determines the whole chart, in this instance a wind rose graticule, it is logical it will also be the scale for the whole Portolan. Thus in these very first portolan’s by Petrus Vesconte we see the culmination in geometry of their construction and the use of rectangular alignments for the basic chart. Concentrating on the charts of Vesconte prior to exploring others it is necessary to look at his 1321 Atlas, wherein he draws a wind rose as the first diagram and places a scale bar in the most appropriate position possible to illustrate its raison d’être. Firstly, there is no pin hole for a compass point and no circle has been scribed as there was no necessity to do so. Secondly, the scale in the top left corner (that is when the chart is oriented north at the top) provides the most important information appertaining to the construction of the wind rose. Why is a scale required for a wind rose? It is set in a square quite precisely with the NSEW points located there-on. Thus the overall dimension is assured. Thirdly, after drawing the two major lines forming the cross, simple measurements using the scale bar can now be made and the underlying graticule of the wind rose drawn. The measurements are a set of ratios formed by the 22.5° winds and are 35/30/20/7 and can be sized to suit any vellum sheet. Thus the 16 winds are located, although Petrus Vesconte only initials the main four, NSEW and the mid quadrant winds, thus 8 in total. By using just a straight edge, the scale bar, stylus and ink the whole wind rose can be drawn quickly and efficiently. The scale bar is situate in the northwest quadrant, has five sections, the fifth being subdivided again by five. The scale bar is also used to denote the WNW wind position through its drawn width and as can be readily observed the actual five part scale is set within two longer lines; the inner terminates at the second horizontal line. 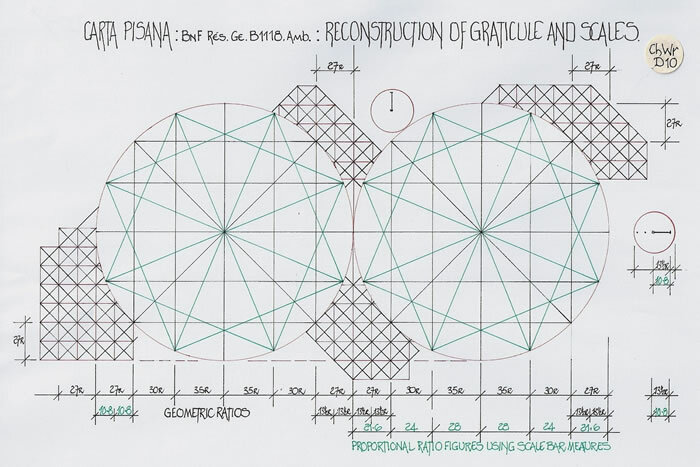 My reconstruction is in six sections on diagrams ChWrD05 and ChWrD06. 1) The external square is drawn first and the NSEW cruciform added. The square has a size which if checked against the inner alignment measures 184 units, i.e. 92 + 92 per quadrant determined by the trignometrical ratio of the 22 ½° segments. 2) Quadrants are then marked off from the centre point in measured ratio, 35/30/27, total 92, although in fact it would be 35/30/20/7 if all lines were required to be drawn. The outer division line which would denote the 67 ½° wind is omitted, the scale bar indicates it. 3) First the inner square is drawn joining the cardinal points and the 45° lines are drawn, but as can be seen avoid the scale bar. 4) By measurement for the7 ratio the eight markers for the 22 ½° winds are denoted by a dot. This is of course the distance the scale bar is from the edge of the square. 5) The squares formed by those marked 22 ½° points are then drawn. At this point in the exercise there are four major squares including the outer frame. 6) All points and major lines can now be drawn denoted by their colour code, red, green and black. But it should be noted that the complexity of the diagram precludes easy reading. It has already been pointed out, but must now be emphasized, that at no time has a pair of compasses or dividers been necessary in the constructional drawing of the wind rose. It is line geometry of square, rectangle and triangle which has been used and this fully accords with the text by Ramon Lull, as will be explained later, but beautifully illustrated by Petrus Vesconte in his iconic Wind Rose for an Atlas. He also wrote that the “mile in his day was longer than the Roman Mile and that elsewhere the league was used.” “ Una mica me savant, en el foli 60, explica que la milla de la seua epoca es mes llarga que la milla romana I que en alters paisos s’usa la llegua, que equival, segons el lloc, de tres a cinc milles. Vegue Almagia, R.: “Monumenta Cartographica”… cit., vol 1, page 97. The basic measures are; Roman Mile 1.4791km; Statute Mile 1.6093km and the Toscane Miglia is 1.633km. That text describes the scale bar as allotting 10 miles between points, then 5 spaces for one oblong quadrilateral and then the quadrilateral makes sevenfold, and thus is no more than (to modern ideas of mathematical description) a rather obscure literary methodology to describe the wind rose setting out. We have already shown that Petrus Vesconte used his scale bar to indicate the 7 ratio unit and that the main squares are 35 units, that is 5 x 7 = 35 and is therefore the “seven times 50 that is 350 miles” noted. One of the most striking features of the 1330 chart is the portrayal of the cardinal points by circular motifs and of course the fact they are fully named; i.e. in the north, Septentrun/Tramontana, leaving no doubt concerning the true north position. 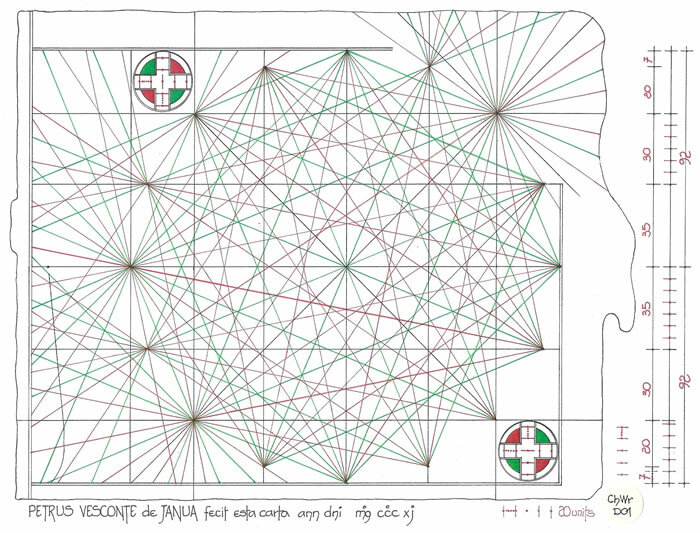 The double wind rose has not only the 35/30/27 ratio lines but to the west of the eastern wind rose the 7 ratio position is clearly marked by a vertical line crossing two graticules, precisely as drawn by Vesconte on his 1321 atlas wind rose construct to mark the smallest ratio. The scale bars, five in all, are set in the 35 ratio divisions and are shown as 2 ½; 5; 5; 5; 5; 5; 5; 2 ½, but the 35 divisions are used to extend the basic 184 unit squares of the wind roses to the north by 2 x 35 units, and, there is a southerly expansion of 25 units. The western scale bar is set precisely 35 units west of the wind rose graticule and thus confirms the graticule extension. There is no circle it is solely constructed by measurement. R J Pujades has suggested that the Carta Pisana and Cortona charts are now at least 100 years later than the Vesconte and Dulceto charts. However if we subject them to the same draughtsmanship scrutiny as applied previously we can show that a continuity of the wind rose design and the use of mathematics has gone unnoticed. The Carta Pisana is illustrated on pages 40/41 of Les Cartes Portolanes and its drawn form has the enclosing circles for the wind rose. I hypothesize that the draughtsman seeing the miniature wind rose scale on other charts enclosed in a circle chose to draw the circles to emphasize his wind rose forms. But as has been clearly illustrated the circle is unnecessary and is merely one further line upon the myriad of lines forming the spiders web that the reader/user has to contend with. However the Carta Pisana has two scales appended, both set in a circle and being 10 units long. Why set the scale length within a circle? Is it in fact a code to explain how the chart has been set out? If the basic 10 unit length is used to measure the wind rose graticule the dimensions are 28/24/16/5.6 which is 4/5ths of the ratio 35/30/20/7 used on the Petrus Vesconte charts. Returning to the circle enclosing the 10 unit scale bar, measure the radius with that scale and it is 12 ½ units. Thus 12 ½ to 10 is 5 to 4 ratio and the cartographer appears to have indicated that he has reduced the graticular scale to 4/5ths size for his chart. No mean feat! Thus we can conclude the measurement method is the original and the circle a later addition, and in fact a superfluous addition. But of course it is surely up to the draughtsman if he requires drawing the circle or not; it is not our choice. In his Carta Pisana text R J Pujades coupled it with the Cortona Chart (Port.105) which is shown on pages 66/67 of L C P; the analysis of the scale and wind rose is as follows. The chart has a circular design scale bar with division marks on a vertical frame. But along the northern side of the chart is what may be considered a second scale, or at least the preliminary drawing for a second scale bar. The circular scale has the ratio 5:4, that is the diameter is 5 units and the scale bar 4 units of length. Comparing this 10 unit scale to the putative horizontal scale bar in the North, the alignment is 5 units from the circle to 6 units of the Northern scale bar. The wind rose chart circles can be assessed using both scales; Circular, the graticule measures 15/12.875/11.572 which is a 3:7 ratio reduction from the 35/30/27 unit. Using the plain scale bar we have approximately 18.15/15.56/14, or a very close 50% reduction of the 35/30/27 unit. It is in fact 1.92857 and as such is 96% correct. If we now check the distance measures, which on this chart is so very easy as the graticule marks the distance from Djerba Island to El Arisch, some 2200Km, we have a total of ; 11.572+11.572+12.857+15+15+12.857+8.572 ( i.e. 27/27/30/35/35/30/20 ratio parts), which totals 87.43 units and hence each unit is c25Km which is twice the distance noted on the Vesconte Charts. Although the western edge is cut, the shape of the North Western littoral of Europe is similar to the Carta Pisana and it is possible the cartographer for the Cortona Chart wished to limit the wind information to the Mediterranean Sea only by reducing the wind rose size. Its usefulness is not diminished in anyway by its small size in fact produces a far easier view of the actual chart to be used by ensuring an uncluttered view by a myriad of lines. If a study is made of the Anonymous Genoese Chart dated c1350 and shown as C10, LCP pages 140-141, the scale bar measures the graticule at 40/34 2/7ths/22 6/7ths/8, instead of the normal 35/30/20/7. It is thus 8/7ths larger which is of course so simple to achieve, the 35 becomes 40 and the 7 becomes 8 units; but measure the distance between Djerba and El Arisch and it will be found to be the same distance as the previous charts with the scale of c8 Toscane Miglia or 2 leagues per division. Thus the graticule has been enlarged to no doubt provide a visually easier chart to read; there is no other reason for the alteration. But this indicates clearly the simplicity of using the wind rose graticule at any scale required, and thus to suit any size of chart. The mathematical abilities of medieval man are not doubted. What is so very apparent though, quite unfortunately, is their lack of the means to produce very accurate Ratio numbers for the geometrical angles of a circle as is clearly illustrated by the Postscript text, A guide for the Perplexed. Thus there is an inbuilt error which appears quite regularly in the Marteloio calculations, and is in fact inherent in the 35/30/20/7 ratio units for the wind rose. The 22 ½° and 67 ½° angles by tangent ratio are 35:85 which accurately are 22.38° or 67.62°. These are very acceptable ratios given the circumstances for medieval mathematics. We know of Sine tables and Chord tables which can be used in a circular calculation, but to forgo the circle and use the measurement of the graticule required a catalyst, which could be shown to be far simpler to use. “Why does geometry consider a geometric line before considering a triangular line? Solution; a circular figure does not divide into equal parts as readily as does a triangular figure”. We can consider from the above (and the whole of Ramon Lull’s two texts) that Petrus Vesconte may well have read or known of their geometry and considered that the square was the appropriate frame for his geometric designs and atlases. He was using measurement, a square and triangle, not division by a pair of compasses and is therefore complying with the text of Ramon Lull. Thus no circle! Taking the ‘Occam’s razor’ route, the simplest method to construct a wind rose will not include the use of compasses. Even today they can be difficult to use to scribe a circle with a quill as the drawing implement. When using, you must not lean the compasses over, you must ensure an even pressure at all times for the whole circumference and be cautious about stopping and starting and joining the ink line. Thus given the option of using a straight edge on a measured length this would no doubt be the simplest and of course is the method used to draw the wind lines in either instance. The wind rose graticule is the prime arbiter of the Portolan Chart. The drawing of the graticule is controlled by the scale bar, that self same scale bar that is the inset maps scale. Thus the graticule is of prime import for all aspects of the charts construction; it cannot be omitted as it is the base onto which the chart is constructed determining every aspect of the chart which includes its magnetic bent format as is discussed in my other texts. The fact that it could be used for other purposes, as R J Pujades suggests, copying being one, is a by product of its supreme importance. I therefore consider the text contained within pages 473/481 and 513/514 of Les Cartes Portolanes should be re-appraised not only in the light of the re-dating of the Carta Pisana and Cortona Charts, which are no longer the first exemplars, but mostly in light of the foregoing research which clearly shows a total neglect of the evidence here-in presented, known about, but ignored. 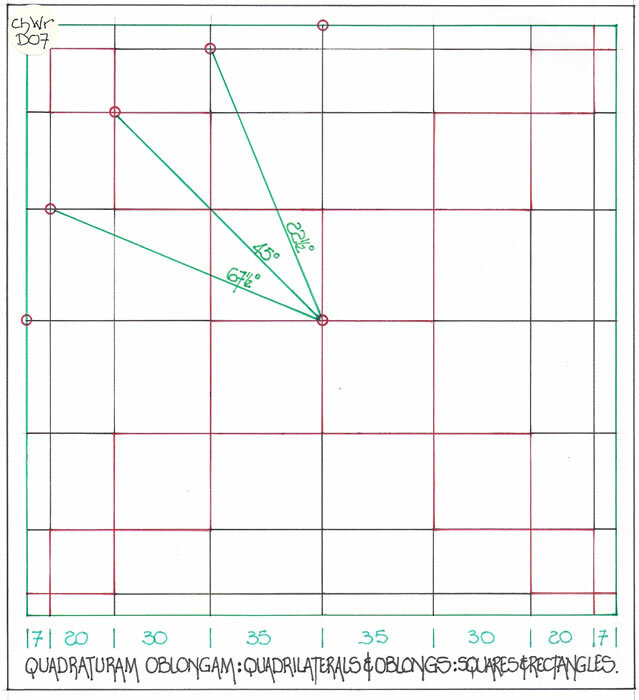 The Graticule is the primary agent for Portolan Chart design and construction being both the scale determinant and measurement tool for a chart. Thus R J Pujades considers it absurd to attempt to precisely determine the numerical scale of a chart. But, as has been clearly shown the wind rose scale is also the scale of the chart and hence we have a second (or first) method of measurement, the graticule. Therefore we can choose random measures across a chart which can be clearly assessed against the scale bar or cruciform scale or, we can equally access the measures via the graticular units. Thus where Pujades states, “for each chart I give the approximate average size of one of its basic units represented on the scale (equivalent to 50 miles sub-divided into five 10-mile units) and those of five different, very deliberately chosen, crossings.”, we can measure each by the unit scale, measure the geographical distance and arrive at a mean value for each unit. As has been shown previously in this text the miles unit quoted by Pujades (and in contemporary texts i.e. de Canistris) have been shown to be a mis-understanding of the distance measures. This is no doubt through the probable reading of the scale bar units marked as 5 and 10, and their being taken as Miglia when no reference is made on the charts to their actuality and the difficulty of ascertaining the actual unit length mentioned in any text, (See Andreas Biancho where he quotes 57.6 and 62.5 miles per degree on one diagram, one Arabic one Italian), as the variation was considerable with no possible alignment. 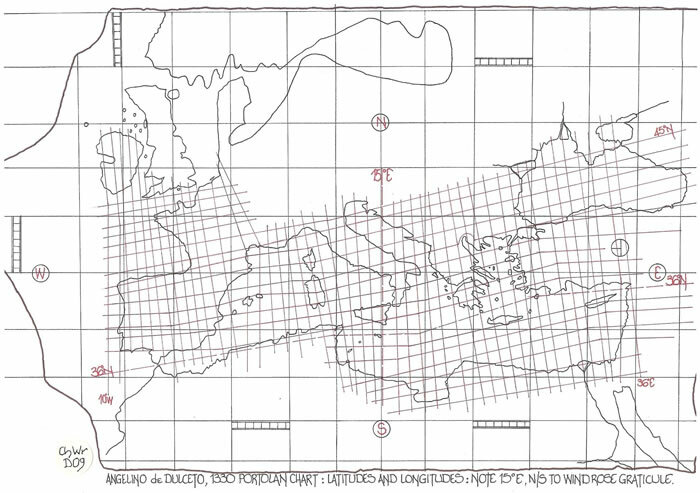 But via the overlay, as diagram ChWrD12, of a Portolan chart upon a Mercator chart with the Mediterranean Sea length equalised from the Pillars of Hercules to the Gulf of Issus we can show that what has been indicated is an acceptably accurate distance from Djerba Island to El Arisch which in turn can be used as a measurement check (one of many) for the charts scale. This of course is the same measurement already used to ascertain the graticule measures of 2 leagues per division. Thus by a clear methodology, rather than random choice of distances to be measured, that is ascertaining their veracity for utilisation by comparison, the scale can be assessed. This is of course of paramount importance as the charts have been shown to have variations in their magnetic declinations and thus from one to the next across a change in declination there will be a difference. Finally it is necessary to raise the question of where the accuracy came from in the first instance. Is it from the Roman period and their itinerary distances, their maps and charts, or did it evolve in a later period of sailing by the Arabs and then the Normans? Questions that must soon be answered but there are too many for this singular text. It has been pointed out to me by several researchers that a large number of Historians, particularly of cartography are not interested in the mathematical and geometrical basis of a map or chart construction. For charts particularly, they have not studied the Tavola de Marteloio, as it is all mathematics and hence have not followed the simple facts of medieval mathematics and geometry which form the basis of maps and Portolan charts. In the 12th to 17th centuries angular geometry was expressed via the ratios determined from the sides of a right angled (one angle 90°). These are known as the Sine, Cosine and Tangent ratios and are given as follows; Sine = opposite side/hypotenuse; Cosine = adjacent side/hypotenuse and Tangent = opposite side/adjacent side. Hence the medieval cartographer used these ratios to draw the wind rose directions, calculate distances and effectively construct the maps and charts. Thus a study of the Tavola de Marteloio is so very necessary if a historian is to understand the construction process of a Portolan chart. The Tavola de Marteloio is as follows and comprises a table of Tangent ratios to describe each of the eight winds of a quadrant. 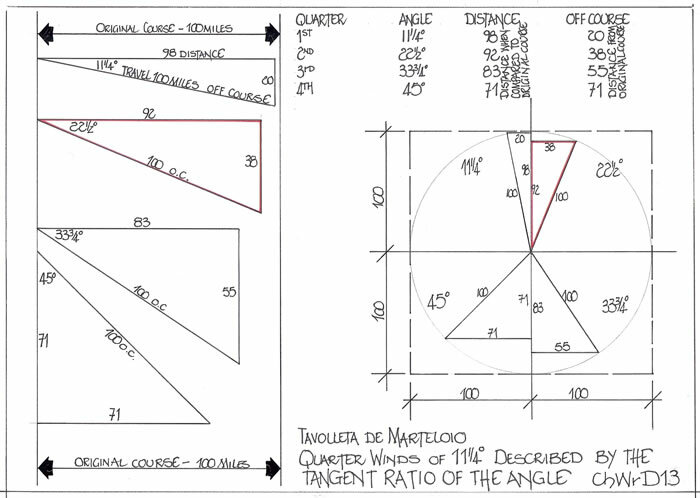 Study diagram ChWrD13 and thereon are set down the above quarter winds and their tangent ratios as per the Tavola de Marteloio. Now study the wind rose diagram ChWrD14 which follows. The immediate difference to be noted is that the tangent ratios are determined as if encompassed in a circle. Indeed it has been thoroughly discussed and shown that the circle is not required but it may be lightly etched to assist the draughtsman or drawn properly. But the base, arbiter and scale of the Portolan chart is the measured graticule formed by the tangent ratios which is a precise square having a notional measure of 2 x 92 trignometrical units (tru’s). The subdivisions are 35; 30; 20; 7 tru’s, total 92 tru’s. As will be read in my texts on the website, the wind rose graticule varies in size and thus scale. This is achieved by using the standard 22.50° triangle, as diagram ChWrD14 illustrates, and the change in measurement is achieved merely by using a pair of compasses to draw an arc to reduce (or enlarge) the tangent ratio figures as illustrated from 39:92 to 35:85 to 32.5:78.5 and 30:72.5. But of course these are but four of many possibilities. Therefore I can clearly illustrate that medieval cartographers had an excellent grasp of mathematics concerning the basic right angled triangle and used it to construct their maps and charts. M J Ferrar March 2015. Pujades i Bataller, Ramon Josep, 2007, Les Cartes Portolanes. Barcelona, Institut Cartografic de Catalunya. Campbell T, Portolan Charts from the late 13th C to 1500. Chicago, HOC, vol 1, chapter 19, and website at http://www.maphistory.info/portolanFutureResearch.html. Vatican Manuscript, BAV, Codex Vaticana 6345, f.59r. Ferrar MJ, Cg1457, The Genoese Chart. Go to cartographical page on website for full text. Ferrar M J, 2014, Ramon Lull, Michael of Rhodes, Andreas Biancho and A N Other, Marteloio, as text ChMa1 on http://www.cartographyunchained.com. Ramon Lull, Ars Magna generalis, Decima pars, article 82, geometry, de application fo. Xciii and forma de navigatide fo xciiii, and in Undecima pars fo cxxii, de qstionibus navigationis. Ferrar M J, texts Chpo1, Chpo2 and ChPo3 on this website fully detail the analysis of many Portolan Charts, their variable declinations and the original construction and copying via a template. REVISIONS TO THE ORIGINS OF THE CHARTS FORMAT AS DRAWN. When Petrus Vesconte set down the methodology for the construction of the Wind Rose Graticule on his seminal diagram in the 1321 Atlas held by the Lyon Bibliotheque, he utilized the scale bar to explain each and every measurement. Thus the individual sections of the graticule actually measured 35: 30: 20: and 7 scale bar units, which of course represent exactly the triangle ratios of angles as the text ChWr/1 explains. However, when other Portolan Charts are investigated it can be seen quite clearly that although the overall measurement of the graticule (that is the 184 or 92 TRU measurement) is normally a precise scale bar measurement, the individual sections are somewhat unwieldy measures, although of course proportionally correct. It is as though the internal measurements are unimportant and do not require to be accurately known. However of course they naturally provide the correct angular lines for the wind rose construct. Why and how should this be the methodology? 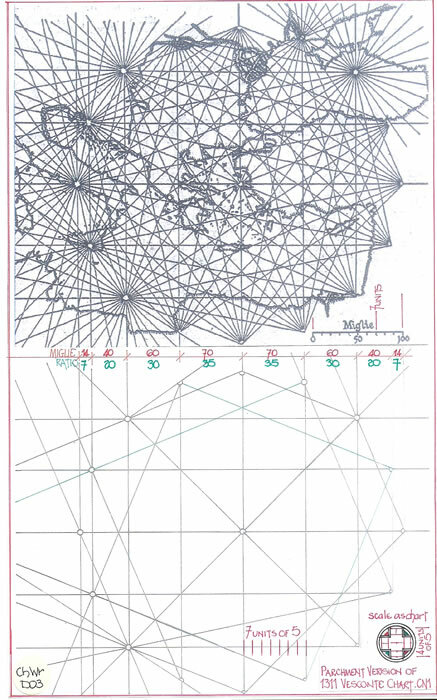 The methodology is a pure simple geometrical construct based upon projecting straight lines NS or EW across the vellum or parchment and utilizing 45° lines to provide the directional transfer points. I have split the methodology into 6 sections, emulating the 6 sections I discussed apropos the Petrus Vesconte Wind Rose construct. The Diagram ChWr/2/D01 follows the written description with referencing by letters. There now exist a series of 4 squares which measure by ratio 92 x 92, 85 x 85, 65 x 65 and 35 x 35 TRU and these are the base squares of a typical wind rose graticule. 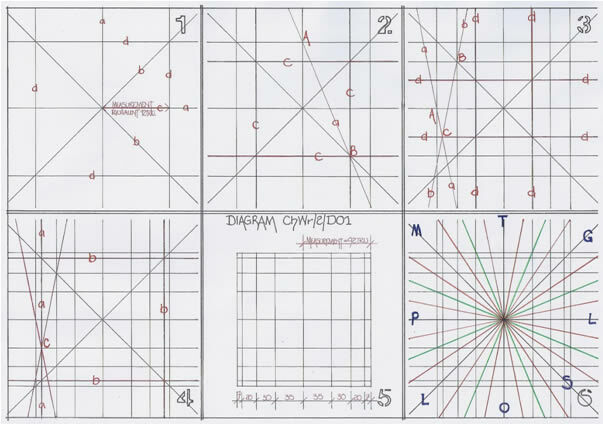 Thus with only the single 92 TRU equivalent measure used on the vellum/parchment a complete wind rose graticule is drawn which enables the draughtsman/cartographer to draw as many or as few wind direction lines across the whole chart as they desire. There are actually two methods of drawing a wind rose graticule or wind rose. If the Cornora Atlas f36 is studied, there-on are only the 24 winds set at 30 spacing. There is no graticule and hence a compass or protractor could have been used to mark off the required alignments. But if the actual wind rose graticule is required then it will be far easier to utilize Triangle Set Squares, cut to match the 4 angles that are always part of a Portolan Chart Wind Rose, that is 11 ¼°, 22 ½°, 33 ¾° and 45°. The extra two Set Squares at 15° and 30° are optional. Thus the wind rose graticule can be drawn very quickly and accurately without recourse to using a pair of compasses. Raymond Lull in his text exhorted the use of triangles and when the wind rose graticule is constructed the reasoning is self-evident. Thus the Portolan chart is based upon the triangles properties for its construction. Then with the Marteloio system of recovering a required course when deviations have occurred, we can fully understand the triangular ethos. These two triangle systems based upon simple ratios are medieval mathematics at their finest. Forget your Sine, Cosine and Tangent tables; forget your scientific calculator and return to the mathematics of proportionality, ratios and dealing with the ‘spurious 1’, which is always interfering with the easy resolution of a computation in medieval mathematics. As a simple example I offer the problem found by Roman Geometres in their survey calculations for the simplest of their works the Actus Quadratus, a square field. The AQ is a land area of 120 x 120 feet and the Roman Geometres used a 10 foot or Decampeda Rod as the measuring tool. Thus to set out a square accurately the diagonal measure should be used to lock the 4 sides into their 90 degree format. But at its simplest the square is 12 Decampeda x 12 Decampeda, which by simple mathematics, from the Pythagorean triangle formula where the square on the hypotenuse equals the sum of the squares on the other two sides we have; (12 x 12) + (12 x 12) = hypotenuse squared, or 288 = hypotenuse squared. But the square root of 288 is in our terms 16.97 units and is not exactly the easiest length to measure with a 10 foot Rod. However look again at the figures and simplify them. Therefore, (12 x12) + (12x 12) = 288, but the square root of 289 is 17, the spurious 1 intervenes. Thus the Roman Geometres utilized a triangle of 12: 12: 17 for land surveying. Now study the Tavola de Marteloio and the 4th quarter or 45° alignment. The distances given for a 100 mile hypotenuse are 71 & 71 miles. The mathematics are therefore, (71×71) + (71×71) = 100 x 100 or 10000, but of course it does not as it should read (71×71) + (71×71) = 5041 + 5041 = 10082 miles. But use the correct figure of 70.71 and you have 5000 + 5000 = 10000 and thus we read how the pragmatic medieval mathematician has chosen the closest whole unit to the actual measure. Would that they had used 70 ¾ instead, the accuracy would be excellent. Thus if the Tavola de Marteloio is studied, as fully explained in my text ChMa/1 , it will be clearly seen how medieval mathematicians manipulated the figures to provide actual whole number results for their calculations and accepted the minor aberrations. I therefore suggest to researchers into the inner workings of Maps and Charts that they forgo the use of scientific calculators and return to the simplicity of childhood mathematics and use just a pencil, paper and of course the scale bar of the Map or Chart being reviewed. The Portolan Chart is far more complicated in its draughtsmanship and geometry than in its Historical portrayals. Those can be added to suit any taste and requirement of the purchaser. What cannot be avoided is the necessity to produce a mathematically and cartographically precise base for the map or chart. Thus that fact is the arbiter of the maps and charts, coupled with the undoubted skill of the early draughtsmen and mathematicians who provided them. It would serve the viewers of medieval maps and charts better in the future if more attention was paid to the draughtsmanship and mathematics than the history there-on.